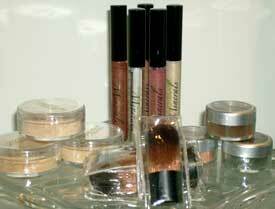 Sole Therapy Mineral Makeup utilizes the finest ingredients available. Although the ingredient lists of different mineral products may appear to be identical, they are not. There are several grades of dispersions, a variety of bulk densities, particle sizes and opacity levels. The quality and variations in particle size, grade, feel, etc. all contribute to the final product. (Pressed Minerals need additional ingredients for binding and pressing). The loose versions are the most natural and recommended following treatments. Our revolutionary foundation provides excellent coverage while imparting a youthful glow to your skin. The creamy natural minerals brush on like a powder, leaving skin radiant and dewy - like brushing on a fine layer of perfect skin. Easy to use, long lasting and perfect for all skin types, this foundation is also a natural sunscreen. Anti-inflammatory properties to help acne, sensitive and rosacea-prone skins. Call to schedule a 10 minute Complimentary consultation!